If you have read my guest post at The Exquisite Niche or if you've been to my Filipino Cuisine page, then you know how much influence my country's cuisine got from Spain. The Philippines was colonized by the Spaniards for almost 400 years, so many of our dishes are of Spanish origin. Today, I'm bringing you another one of those. It is called Pochero...Fish Pochero in particular. The term Pochero is from the Spanish word Puchero which means stewpot. According to Wikipedia, It is a kind of stew prepared in Argentina, Colombia, Uruguay, and in Andalusia and the Canary Islands of Spain. 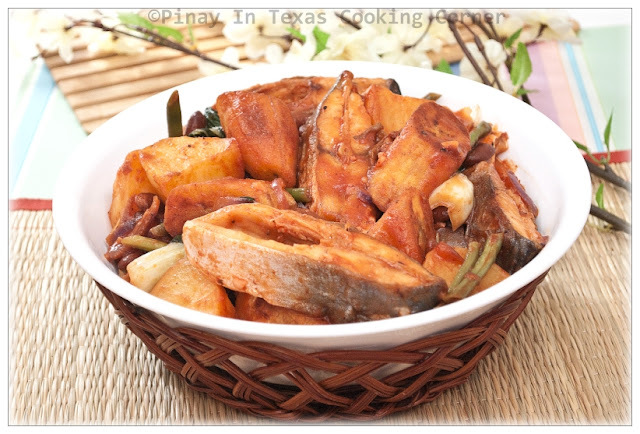 Just like Spanish Puchero, Filipino Pochero is usually cooked with a wide assortment of vegetables and meat like beef, chicken and pork, but Filipinos have come up with another version using fish. Beef, Chicken and Pork Pochero are the popular versions for special occasions like fiesta and Christmas, while Fish Pochero is commonly served during Lent. 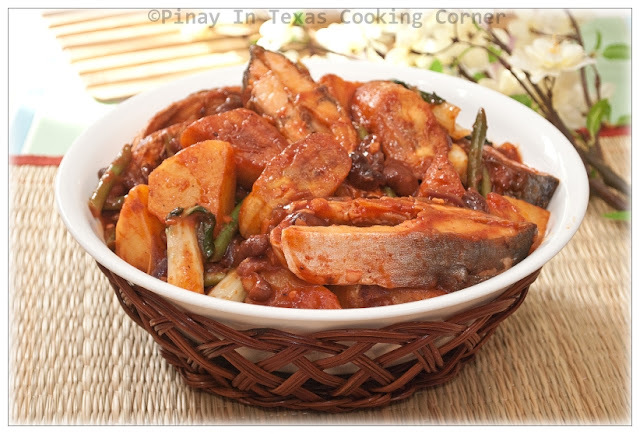 Regardless of the meat used, Saba banana is a must-have ingredient in Filipino Pochero. The dish won't be the same without it. I remember how much my mom loved cooking pochero (all versions of it)! Instead of tomato sauce, she would sometimes use pork and beans. I really loved the sweetness it adds to the dish. So whenever she uses tomato sauce, I would ask her to add a little sugar so it would still be sweet...and I would always ask her to put lots of fried bananas which I really love! 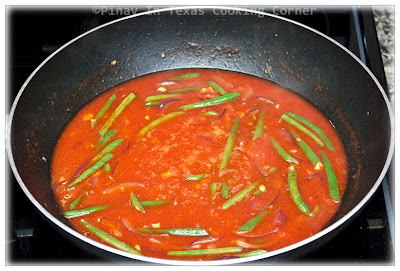 For my pochero, whether I cook it with beef, chicken, fish or pork, instead of using pork and beans, I use tomato sauce, banana ketchup and a little sugar to attain the sweetness I remember from my mom's version. Aside from Saba bananas, freshly cooked kidney beans are a must-have for my pochero. 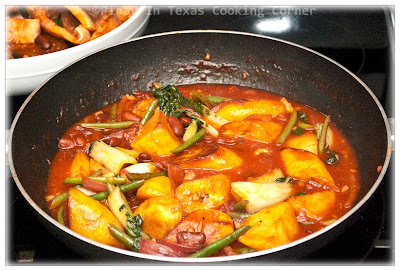 Check out my version of Fish Pochero for Meatless Friday and let me know what you think. 1. 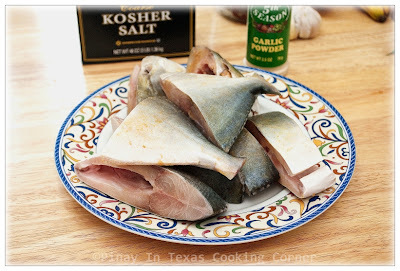 Sprinkle fish with salt and garlic powder. Let sit for about 15 minutes. 2. Meanwhile, in a large skillet over medium heat, fry saba bananas and potatoes in light olive oil until golden brown. Remove from skillet and set aside. 3. In the same skillet, fry the fish until medium brown on all sides. Remove from skillet and set aside. 4. In the same skillet, saute garlic and onion until onion is almost translucent. Add green beans and saute for a minute. 5. Add water, tomato sauce and ketchup. Bring to a gentle boil. Add sugar and fish sauce. Mix well. Season with salt and pepper to suit your taste. Simmer for about 3 minutes. 6. Add kidney beans and bok choi. Simmer for 3 minutes. Add fish and simmer for another 3 minutes. Transfer fish to a serving plate. 7. Add the fried saba and potatoes into the sauce. Toss until well coated. 8. Remove from heat. Transfer to the serving dish with the fish. Serve with hot rice. This dish looks really tasty! All these of your fish recipes just fits my hubby's taste. Like I have mentioned, he lives by fish most of the time. I have become a vegetarian for the past few months Tina but I still cook meat for my other half. Just that I am not sure on the bananas and wonder if its available over here. I must say this that its a unique and new discovery recipe but with cooking fish so often, I really need many other different types of fish recipes. Looks simply amazing but without the bananas ketchup, another one ingredients cannot be found over here. It will taste fine even without the banana ketchup, Nava! I just use it to give the pochero a tinge of sweetness. Hi Jo! Nice to see you here again. Glad to c ur space...luv the fish pochero.Perfectly made. Hi Priya! Welcome to PiTCC. Thanks for visiting and leaving a comment! Oh, thanks so much dear! I really appreciate it! Bananas, beans, fish.. this sounds like a special dish! Yes, it is truly one special dish! This looks awesome! Tina, you always talk about your mom who was a great cook, but look at you - you are such an amazing cook! I really feel Filipino food has so much influence from Spanish, Chinese, and Southeast Asian cuisines and I'm really fascinated by it. It's so strange that we barely find Filipino restaurants too! People must rely on home cooked meals which means there must be lots of great home cooks like you! Tina, thanks for sharing another amazing recipe. This is why you're on my blog roll. Your recipes have flavor-packed ingredients and you really think about your audience by adding the step-by-step photos. I'm confident that I could make this dish and have it turn out just like yours. Loving your blog more every day! I've never had this. It looks pretty good though! I haven't had pompano in a while since I don't fry fish anymore. Then again, I could just pop it in the broiler huh? Yum! Another beautiful fish dish! I love it! Tina, I've been nominated for this Int'l Women's Day. Appreciate if you could support this event & click on "Like" @ Support International Women's Day! Thks, dear! Done, Shirley! :) Good luck! This is a beautiful way of cooking fish Tina! And the combination of flavors is quite unique! Thanks for sharing a family tradition! I've never thought to use pork and beans in pochero, great idea. Your fish version looks absolutely delicious. Hi!! 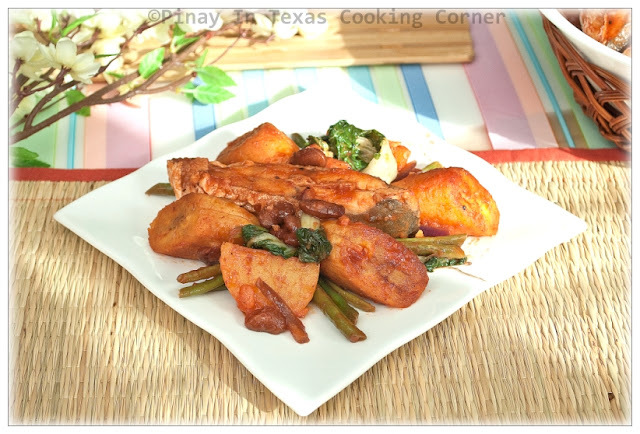 Just wanna asked if its alright to use cream dory or basa fillet for this kind of recipe? Thanks! 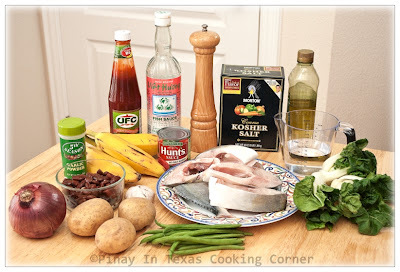 You can use any kind of fish for pochero. You should just be more gentle when using fillet so you won't break it into flakes. Mabuhay! How lovely and sweet feeling to encounter a food blogger like you Miss Tina! I feel very proud and honoured to you my kababayan!! I always longing Filipino home cooked dish. Filipino restaurants are common here in Singapore but a home cooked is still different. It's pretty amazing, i can cook now our traditional food inspired by you!! Glad to have you here, Rose! It's to my kababayans like you that I dedicate this website!